You are putting together a conference call, and you need it to happen now. Whether you are a small business start up or a Fortune 1000 company, your meetings must happen when and where the need arises. You are looking for toll free conference call, ready conference plus and others budget conferencing provider that is reliable, offers a variety of simple options that meet your business needs, and has the right price. 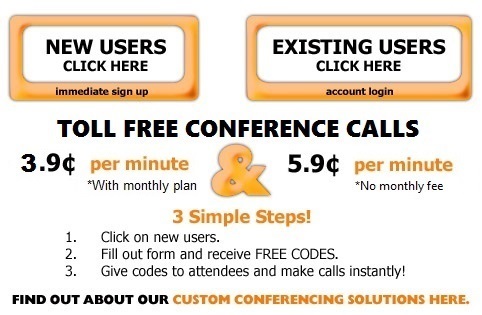 CONFERENCING FOR LESS, a leading conference call services provider offers businesses what they need: a reliable, end-to-end source for conferencing services with broad product suites backed by trustworthy, dependable customer service. Meet on a moment’s notice, with toll free audio conferencing, recording, web conferencing, and online account management, available at your fingertips. After submitting your online application, your live conference calling account will be sent to you instantly! We hope you'll find the information you need on this site about our company and the products and business conference call services we provide. We look forward to working with you. For more information call 888.218.5287 or contact us online here. Home | www.conferencingforless.com © 2014 www.conferencingforless.com. All Rights Reserved.